Luton defender Jack Stacey is looking to seal the deal as soon as possible with just four games of the season to go. The Hatters host Crewe Alexandra this afternoon knowing that a victory could put them within one win of securing promotion to League Two. We fancy ourselves in every game, so the main objective of the season was to get promotion and we’re getting closer. Town then head to Carlisle the following Saturday, before finishing their campaign at home to Forest Green and away to Notts County, as Stacey said: “We’ve got quite a favourable last four fixtures, we fancy ourselves in every game, so the main objective of the season was to get promotion and we’re getting closer. The Hatters put themselves in such a commanding position by beating Yeovil Town 3-0 last weekend as Town chief Nathan Jones felt Luton should they were up for it from the word go. He said: “It’s always a tricky encounter coming here. “They’ve had a wonderful result last week where they won 6-2 away from home where it’s never an easy place to go (Coventry) and to score six was wonderful. “So we knew it would be difficult, we thought the pitch would be slightly more difficult, but I thought from start to finish – we’ve talked about our starts where we’ve conceded away from home early, but we were the ones who got off to a flying start. “We made a big thing of it – our starts have killed us because we score almost every game, if not every game and we give ourselves mountains to climb, so we wanted to get off to a (good) start. “By scoring early and scoring first we did that. You could see it in them, they were really at it. Leading 3-0 at the break, Town opted to settle for what they had in the second period, putting a disciplined display with the hosts already down to nine men from the 31st minute. Stacey said: “It’s something we mentioned that maybe the referee was looking to even it up, but I think everyone’s professional out there. 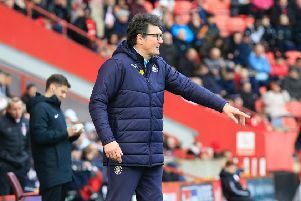 Luton go into today’s clash on the back of three wins from four, while the Railwaymen have drawn just five games all term, losing 14 of their 21 away matches thus far. They have won three of their last four matches away from Gresty Road though, scoring four goals twice, including a 4-3 win at play-off chasing Mansfield last weekend, as Stacey said: “They got a good result against Mansfield, they’re quite an open team and when teams come to us to try and attack that’s hopefully when we can play our own football and play through the thirds. Striker Elliot Lee is another who thinks it will be an entertaining encounter as well, adding: “As long as the pitch holds up, I think that will be quite a good footballing game, because Crewe seem to get it down and play as well.